Brittani Cooper and Johna Dhuyvetter with their horse Red Rider. This is the Trail Challenge the 4-H horses must take. Brittani Cooper and Red Rider start running the obstacle course. The goal is to get the horse comfortable with each obstacle. Red Rider isn't sure he wants to go in there. He needs to step in and step back out to clear the obstacle. None of the horses liked this one. They need to walk across the tarp as it flaps in the wind. Red Rider has no problem with walking under the streamers. Cooper and Dhuyvetter had six weeks to train him. Red Rider wins the Trail Challenge! The Challenge is over but the training never stops. Here Dhuyvetter takes Red Rider for more practice on the obstacle he hesitated on. The future of the Soda Fire horses is a microcosm of the larger issue of wild horses in the West. 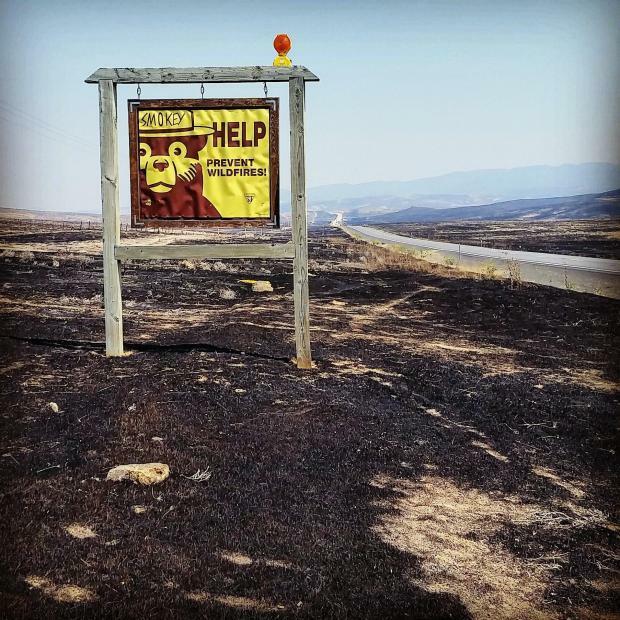 We decided to follow one Soda Fire horse to understand the challenges the program faces. A horse trailer drives through the back gate of the very windy BLM Boise Wild Horse Corrals south of the city. Inside is Red Rider, a nine-month-old weanling who was rescued after the Soda Fire. This was his first home off the range, but for the past six weeks, he’s been living in Horseshoe Bend with Brittani Cooper and Johna Dhuyvetter. Cooper says Red Rider is special. “He is amazing,” says Cooper. Red Rider whinnies at all the attention. The girls are members of the Lone Star Riders 4-H club. Since 2009, The BLM has partnered with the University of Idaho 4-H Extension program to pair up teenagers with young wild horses. The teens “gentle,” a verb here, and train the animals to make them more adoptable. “We teach him how to go over bridges; we get him comfortable with being touched everywhere. We work with tarps, poles, and backing and trotting, pretty much all the groundwork that you would do with a normal horse,” says Cooper. Red Rider is the third horse trained by Cooper, who’s been in 4-H seven years. She loves training the younger horses. These are some of the 279 wild horses rescued off the Soda Fire. Today, four Soda Fire weanlings will take the Trail Challenge. Each 4-H group runs their horse through an obstacle course to see how the training is working. The animals have come a long way from their home that was destroyed by last year’s Soda Fire. “Essentially, the day that they called that Soda Fire controlled, we knew we had to get the horses out of there. 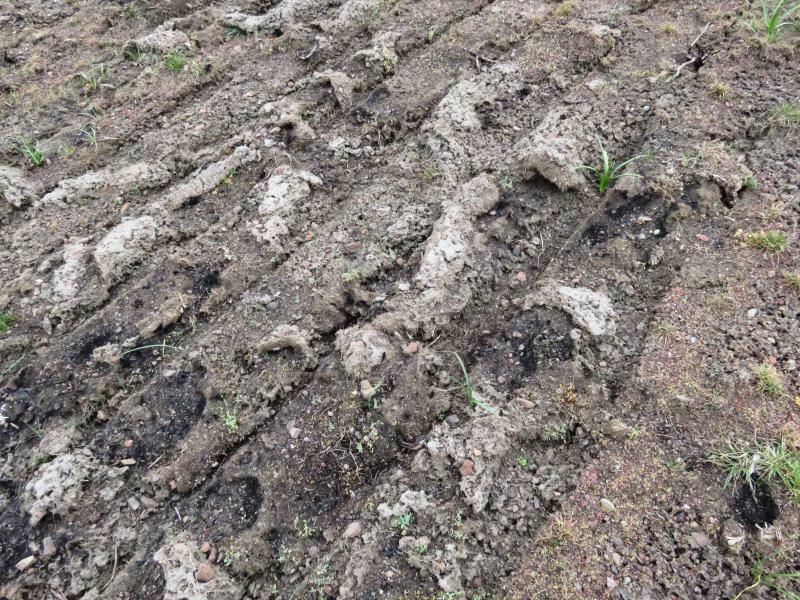 It was black as far as you could see and there just simply was not enough forage to sustain those horses,” says Heather Tiel-Nelson with the BLM. She says 27 wild horses died in the fire. Some were injured. And the rest were starving. 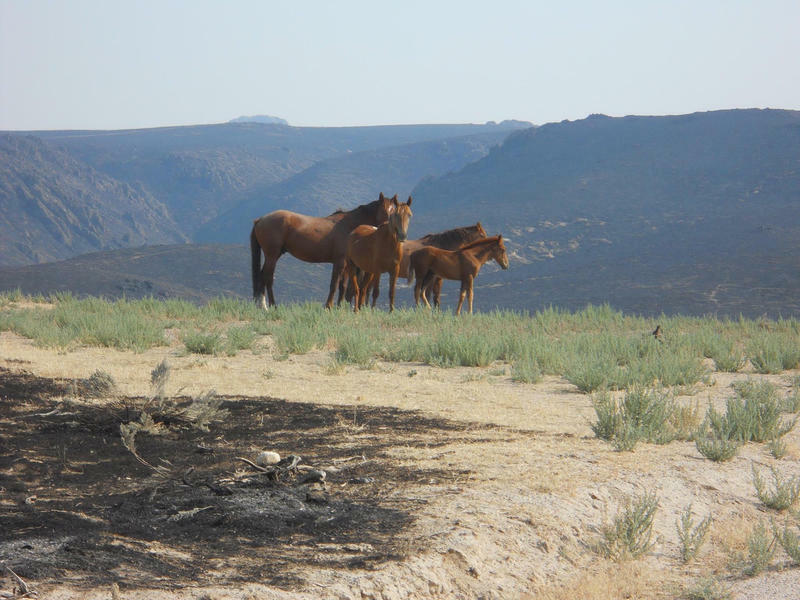 The Bureau, which has six wild horse management areas in Idaho, decided to remove, or “gather” the animals from three of those areas hit by the fire. When herds get too big or the food supply isn’t enough, they’re taken off the range. “They go into either an off-range corral situation or an off-range pasture in the Midwest,” says Tiel-Nelson. The BLM has 46,000 horses and burros from 10 Western states in corrals or pastures. Another 67,000 have been left on the range. But the BLM says there’s only room for 27,000 of them. They need to take another 40,000 off the land, but they’ve got nowhere to put them. Back in 1971, wild horses and burros received federal protection and the BLM took over management of 25,000 animals. Since then, the habitat has shrunk. Wild horse herds can double every four years. And adoption rates have plummeted over the last 15 years. It all adds up to a big problem for the BLM. Adoption programs like the 4-H challenge and the Extreme Mustang Makeover help some. Back at the Trail Challenge, the other three young horses have been led through a series of obstacles. Now it’s Red Rider’s turn. “This is Lone Star with little Red Rider. And you are?” asks Becky McPheters. “Brittani. All right, Brittani, I’m ready if you’re ready,” says McPheters. Becky McPheters is judging the Trail Challenge competition. The horses have to walk over a wooden bridge, step into and out of a horse trailer, walk on a tarp on the ground, walk under streamers of ribbon, and walk through a an “L” shaped obstacle forward and backward. As Red Rider steps onto a wooden pathway, McPheters says these skills make the horses more attractive for adoption. Red Rider is a nine-month old weanling, one of the horses rescued from the Soda Fire. “A new owner just gets to go forward from there. They don’t have to worry about leading it, they don’t have to worry about loading it into a trailer, they don’t have to worry about any of that, they just have to continue that foundation,” says McPheters. But neither the BLM, nor its critics, think adoption will solve the problem. “It takes a certain kind of person with resources, patience and time and skill to train a wild horse and not everyone has that,” says Suzanne Roy, Executive Director of the American Wild Horse Preservation Campaign. Unlike some critics of the BLM program who want the horses gone, she wants to keep wild horses on the range. She says the BLM needs to rely more on birth control to keep populations down. “We support that as a humane and proven alternative to cruel and costly round-ups of horses from the range," says Roy. The Campaign also wants to make more room on BLM land for more horses, by cutting back on cattle grazing. Roy advocates compensating ranchers to give up their permits if it means more horses can go back to the range. “There’s got to be a commitment to really changing and changing in a way that preserves the essence of America’s wild, free-roaming horses and honors why they are important to our country,” says Roy. But the BLM says current birth control methods just aren’t that effective. Last year, the agency started an $11 million dollar research project to find better ways of controlling fertility. They’re also trying sterilization, a practice Mustang advocates vehemently oppose. At an emotional congressional hearing in June, the BLM admitted frustration at the current system and the need for change. Heather Tiel-Nelson says the solution won’t be easy. “Do we have a monumental challenge in front of us? Absolutely. Do I think we’re up for it? You bet,” she says. Back at the Trail Challenge, Brittani Cooper and Red Rider are flying through the course. Red Rider only hesitates a little at stepping in and out of a trailer and handles most other obstacles with ease. “So that leaves our last group in first, I gave a 54 to Brittani and Red Rider,” says McPheters as the small crowd applauds and cheers. Cooper and co-trainer Johna Dhuyvetter are all grins as they lead Red Rider over to collect first place. “It was good, he did really well. He was a little skittish on the trailer; of course it’s a new trailer. I thought he did pretty good overall,” says Cooper. “He did really good. I’m proud of him,” says Dhuyvetter. After the event is over, and the Lone Star Riders have their trophy, Dhuyvetter snuggles up to Red Rider and quietly leads him back over the trailer where he hesitated at first. She coaxes him in and out several times, practicing the moves until he’s comfortable. She slings her arm around his neck and they walk off together across the practice field. The next weekend, the girls put Red Rider up for adoption. But the bond is too strong now and Cooper, who always said Red Rider was special, ends up buying him and taking him home to Horseshoe Bend. They hope to start training a new wild horse through 4-H later this year. Some of the other Soda Fire horses have been adopted. Others have gone to corrals in Reno and Bruneau. The BLM says in a few years when the landscape has recovered most of these horses will be returned to their home on the range. The rest of the animals in holding will remain there, until a better long-term solution can be found. You can watch a new class of wild Soda Horse weanlings, being led through the obstacle course by 4-H members, Friday at 7 p.m. at the Western Idaho Fair. They’ll be available for adoption Sunday at 1 p.m.
A wildfire in southwestern Idaho, fanned by shifting winds and numerous storm cells, grew twelve times in size over a 24-hour span to 123 square miles by early Wednesday. 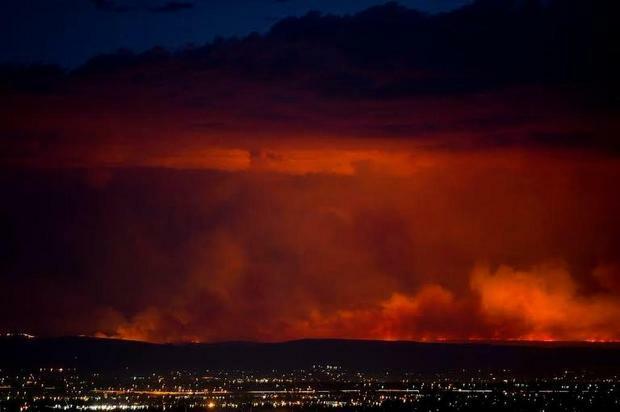 The fire about 40 miles southwest of Boise closed U.S. Highway 95 that connects Marsing, Idaho, with Jordan Valley, Ore. Some 200 firefighters backed by about a dozen aircraft as well as fire engines and bulldozers are attacking the blaze in grassland and sagebrush. There are no reports of injuries or structures lost in the sparsely populated area. The fire is 20 percent contained. 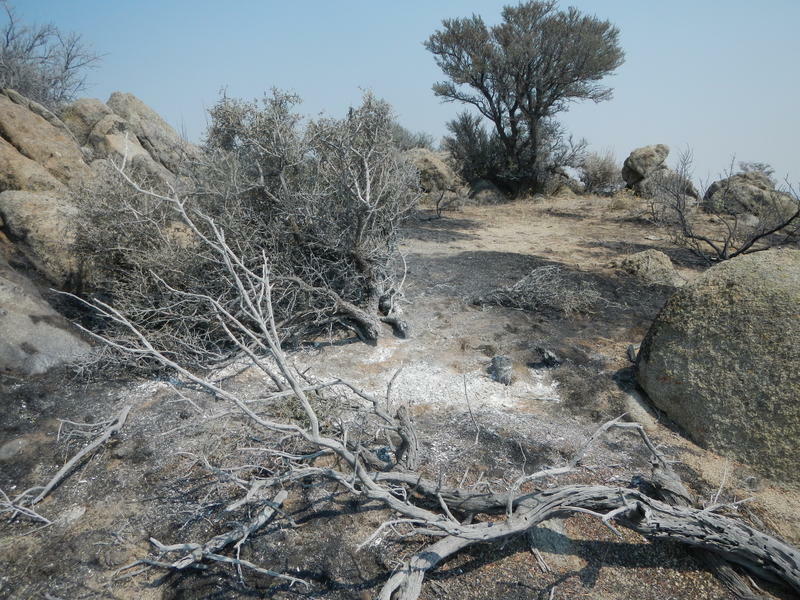 The Soda Fire was officially contained this week, at 445 square miles. 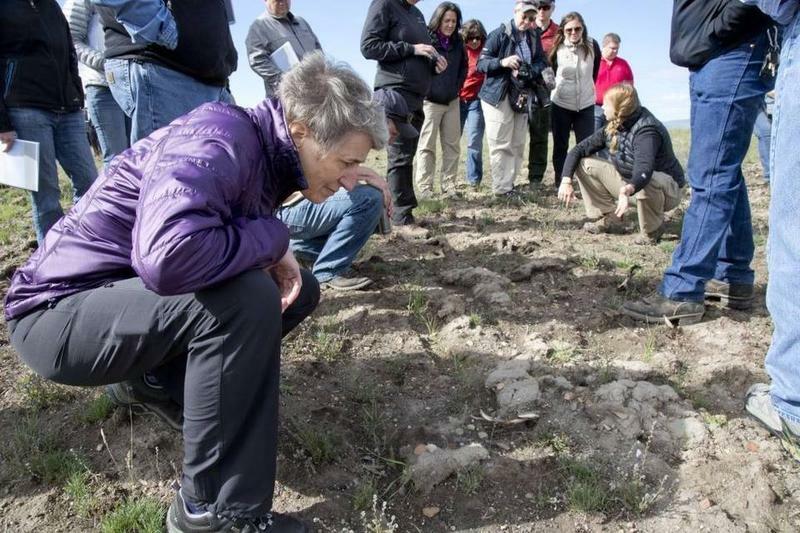 Now thoughts turn to reclaiming the landscape southwest of Boise. A team of 40 specialists spent five days in the field, surveying the burned area. Their goal is to find and fight threats to life, property and resources over the next three years. T.J. Clifford is the Burned Area Emergency Response (BAER) Team Leader for the Soda Fire. The team is working for the Bureau of Land Management but is made up of people from multiple agencies. Wild horses that survived the Soda Fire now face another threat: starvation, after the fire burned their food supply. The Bureau of Land Management plans to rescue those animals and feed and house them until the landscape can recover. Secretary of Interior Sally Jewell announced $10 million to go toward making landscapes more resilient against wildfires across the country. It’s a continuation of a directive she made last year in Boise. She made the announcement Tuesday at the National Interagency Fire Center.